It may sound creepy, but I’d love for you to stalk me! Seriously! I’m always looking for new virtual connections and friends. In this information technology age I am living life on the bleeding edge. I have countless social media outlets and memberships. Today I will list many of them and request that you click on each and connect with me! Please? Without further ado, click away! To find out more about me, read my article: Allow Myself to Introduce Myself. Also checkout my About page. 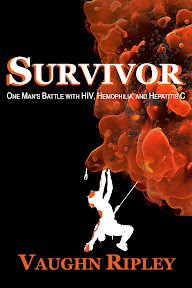 Better yet, read my memoir, Survivor: One Man’s Battle with HIV, Hemophilia, and Hepatitis C.
Enjoy your stay here, and please remember to subscribe to our newsletter and share this site URL with your friends!